1. Humankind is beholden to its zoological evolution, and needs to educate itself for the world it aspires to. Clannishness (small group belonging) is hardwired, and so is the privileging of short-term reactivity to imminent danger over long-term proactivity to uncertain danger. The logarithmic understanding of numbers (a diminishing scale) is hardwired as well, blinding us to the power of exponentially progressing technologies. The combination of the three factors makes it very hard, but not impossible, for humankind to act in concert, for its own benefit, to solve global challenges (global warming, financial crisis, etc.). 2. Oversimplifications are legion, and emotions are a factor. 3. Conversations about education abound with false dichotomies, and absolutist views, that must be transcended. 4. 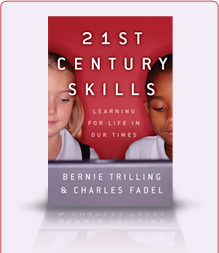 Awareness, adaptability, creativity and collaboration are the most important 21st century skills. 5. It is grand time to act in a world of possibilities—with courage.